chosen by BBC Radio 2's Steve Wright as webcam of the day! Visibility is currently kilometers. The camera is pointing at Chamartín railway station and the Cuatro Torres Business Area. This includes Torre CEPSA, the tallest building in Spain at 250 metres (820ft) high. Webcam transmits a high definition 1920x1080 pixel image that is updated every minute. 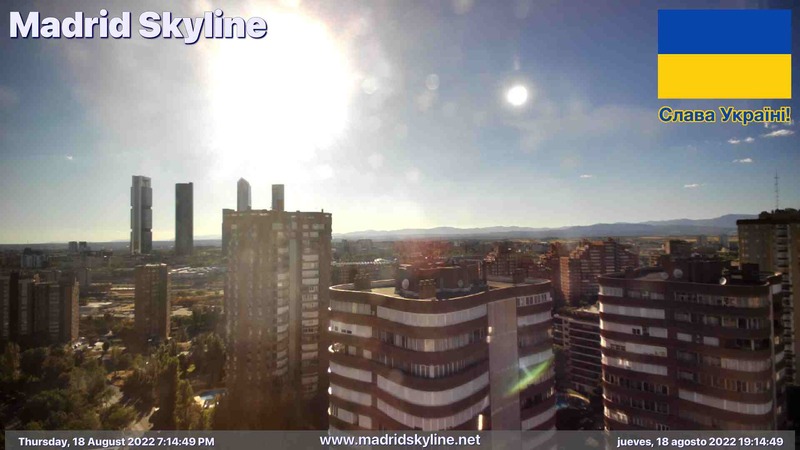 Weather info is from Adolfo Suárez Madrid-Barajas airport (MAD/LEMD), 4 miles away. First light today was at 6:22 am and sunrise was at 7:30 am. Sunset will be at 8:56 pm and nightfall will be at 10:04 pm. Webcam clock is synchronized with the Spanish Navy Observatory (Real Instituto y Observatorio de la Armada) which is the Time Stamping Authority in Spain. Accuracy of webcam clock is usually ±1 second. Local time zone is CEST (Central European Summer Time) which is UTC +02:00, although Madrid is geographically at UTC -0:15. For the first five years I used the 3Com Home Connect / Inside Out Networks Watchport V which worked in near total darkness and had a good quality picture but there's no driver update. After two more years using the Apple iSight webcam which was very low quality, I then used a Logitech® Quickcam® Vision Pro which had a much sharper image than the iSight although the night images were very dark. I'm now using a Logitech C930e which has a wider angle of view and better low light performance although it's still nowhere near as good as the old 3Com. Software is the excellent EvoCam from www.evological.com which seems to have disappeared. Puerta de Europa in Plaza de Castilla. Designed by Philip Johnson and John Burgee, built by Fomento de Construcciones y Contratas (FCC) and commissioned in 1996 by the Kuwait Investment Office (hence their initial name "Torres KIO" or "KIO Towers"). Leslie E. Robertson Associates provided structural engineering services. Each building is 115m (377ft) tall, has 26 floors and leans 15° from the vertical. Chamartín railway station, designed by Alonso, Corrales y Molezún, and Olaquiaga. Torre CEPSA, originally known as Torre Repsol then Torre Caja de Madrid, and then Torre Bankia until 2014. Designed by Lord Foster and built by a joint venture of Dragados and Fomento de Construcciones y Contratas (FCC). 250m (820ft) high and 45 floors, it is the tallest building in Spain. Torre Sacyr Vallehermoso. Designed by Carlos Rubio Carvajal and Enrique Álvarez-Sala Walter and built by Sacyr Vallehermoso. 236m (774ft) and 52 floors. Torre de Cristal. Designed by Cesar Pelli and built by Dragados. 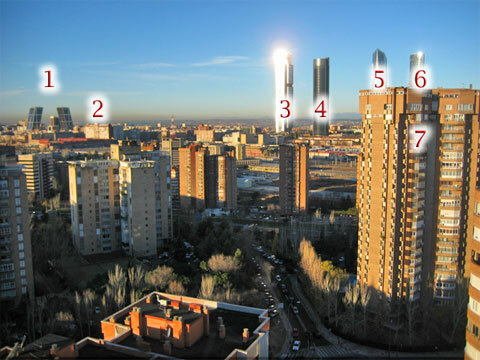 249m high (817ft) and 52 floors, it is the second tallest building in Spain, only 89cm (35 inches) shorter than Torre CEPSA. Torre Espacio. Designed by Pei Cobb Freed and built by OHL. 236m (774ft) high and 57 floors. Condado de Treviño 9. 78m (256ft) and 23 storeys. These are reciprocal links to external websites and we are not responsible for their content. Due to circumstances beyond my control, the webcam had to be moved from its old location on 15th March 2007. This view is being adjusted to include the twin KIO Towers. New: Timelapse video of the first snow in Madrid. Timelapse video of an autumn storm. Timelapse video of the smoke over Madrid from the wildfire in Valle del Tiétar. Madrid Skyline by Luis de Avendaño is licensed under a Creative Commons Attribution-NonCommercial-NoDerivatives 4.0 International License. Website hosting by pair Networks.